President's Message: Can We Regulate Happiness? Rick discusses how an applicant's version of the perfect community may bump up against a jurisdiction's adopted zoning. The committee provides updates on the legislative session. Are you planning to become certified? Study Prep Course Offered -- Sign Up by April 11th! 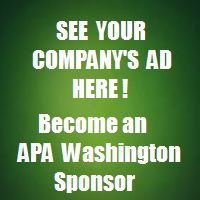 Help Lead the APA WA Chapter and its sections into the future. Looking for new members to join our effort! Great Places - Washington - 2018: Recognizing Great Gathering Places! The Washington Chapter Board of Directors has approved continuing the Great Places program on an annual basis, and for 2018 the theme will be "great gathering places"!